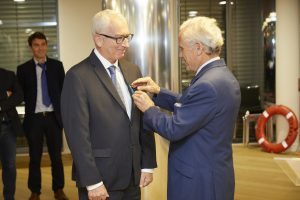 INTERCARGO congratulates Mr Francois THOMAS, a longstanding member of our Technical Committee for over 15 years on behalf of LOUIS DREYFUS ARMATEURS (LDA), for receiving the insignia of the “Chevalier de l’ordre du Mérite Maritime” from the French State in recognition of his invaluable services to the industry during his long career. 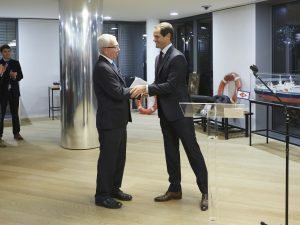 The award ceremony took place on 7 November 2018 at the offices of the LDA Group in Paris. Mr Philippe Louis-Dreyfus, LDA Group Supervisory Board Chairman, awards the insignia of the “Chevalier de l’ordre du Mérite Maritime” to Mr Francois Thomas (left). Mr Edouard Louis-Dreyfus, LDA Group Chairman, congratulates Mr Francois Thomas (left).